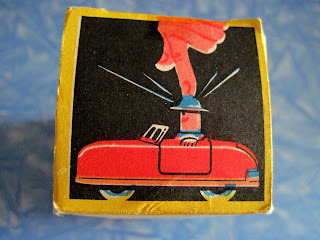 At a recent antique show, one of the dealers had a little box full of tiny charms and Cracker Jack prizes dating from the late 1900s through the early 1930s. I selected several, including a teeny tiny cup and saucer, a wee little frozen charlotte doll, a miniature horse pulling a wagon, and a little figure of a comical photographer. Whenever I find things like this, I'm always amazed at their survival. Imagine how many similar items were lost over the past 100 years to vacuums or cracks in the floorboards! 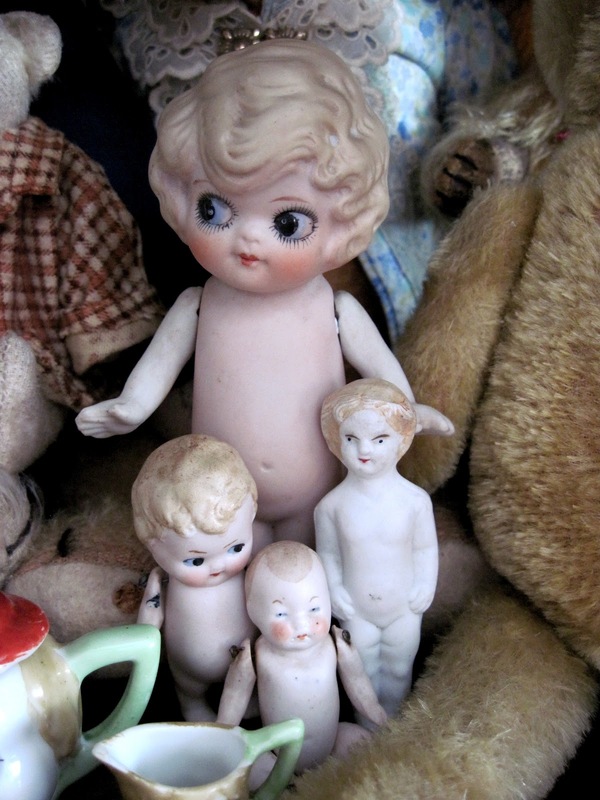 The tiny cup is just .5 inches across, and the doll is 1 inch tall. This funny photographer was my favorite prize in the bunch. A little soldier on horseback still retained some of his original color. 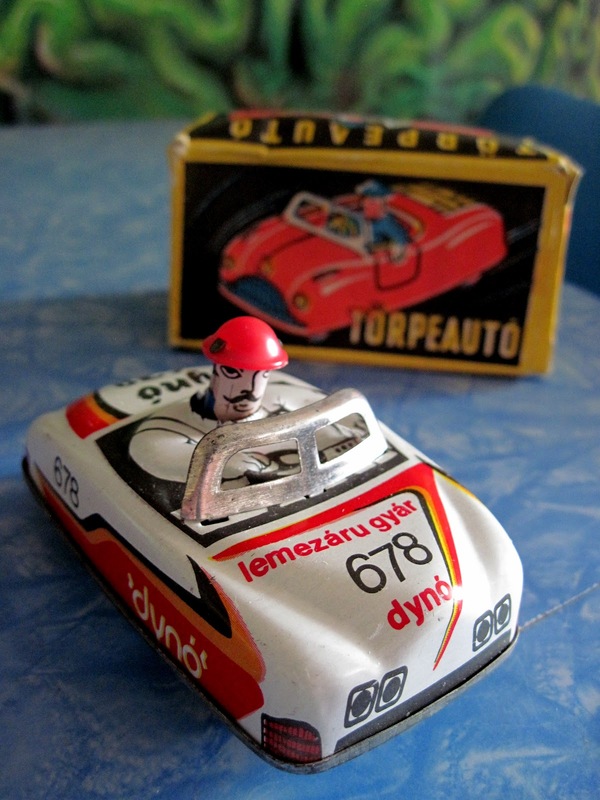 I found this funny little toy car at an antique show recently, still with its original box. 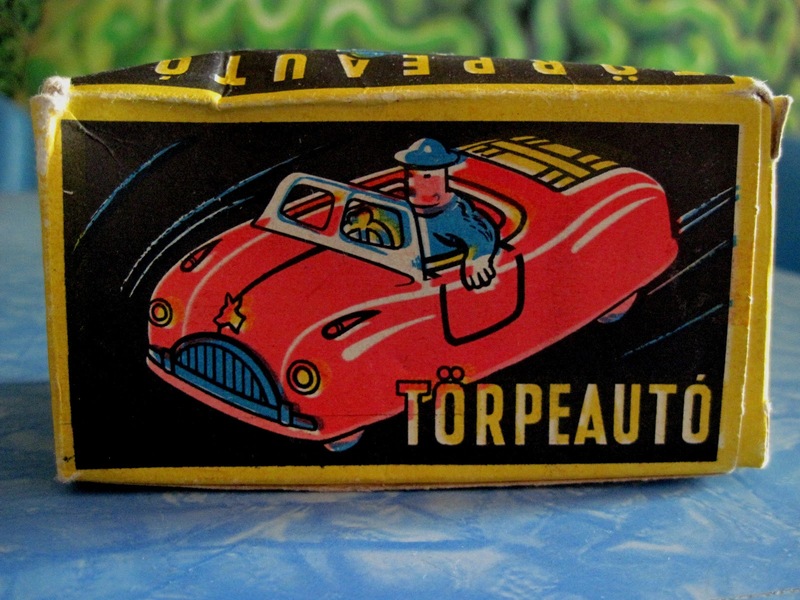 The 3.5 inch long car is made of pressed tin and has a friction motor. When you push down on the little driver's head and then let go, the car zips away. It was made in Hungary and came in lots of different paint designs, but always with the same goofy little driver. Close up of the driver, with his handlebar mustache. How to make it go. 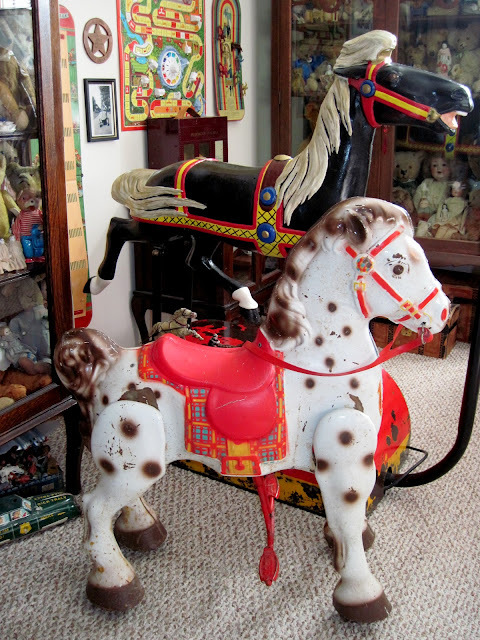 One of the most wonderful horse ride-on toys of all time came out of a factory in Kent, England, from the 1940s through the '60s. The Mobo Bronco was made by D. Sebel & Co., which began as a metalworking firm in the 1920s, making wheels, carts, architectural elements, tank parts, steel furniture, and assorted other things. 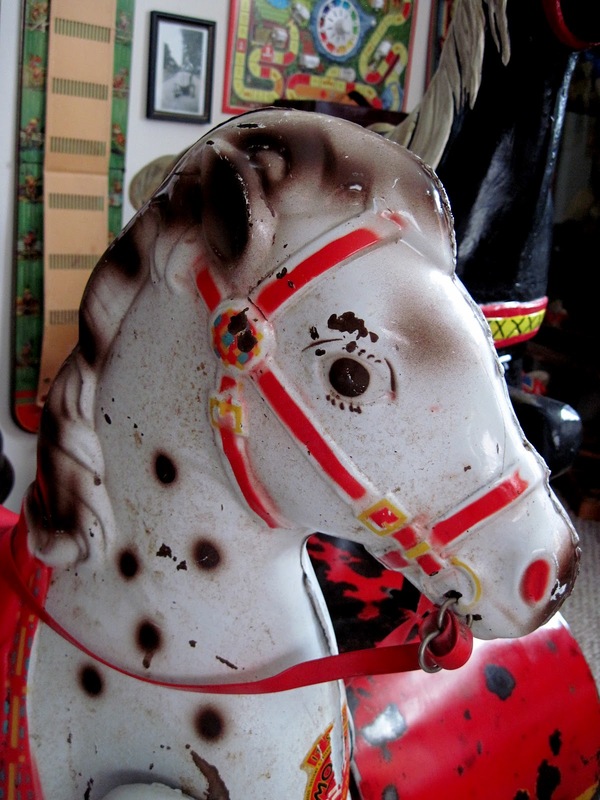 In the 1940s they turned their talent to toys and created the pressed metal Mobo Bronco, a new sort of rocking horse that could actually move along. As the child astride the horse pushed down and then released the flat metal "stirrup" pedals, the horse bounced up and down, and wheels hidden under the hooves propelled it forward. In the 1950s, a steering mechanism was added, and by pushing down on just one pedal, the horse could be turned in that direction. This Mobo is the steerable version, and measures 30 inches tall. Mobo in the foreground, and an Allan Herschell coin-op horse ride in the back. 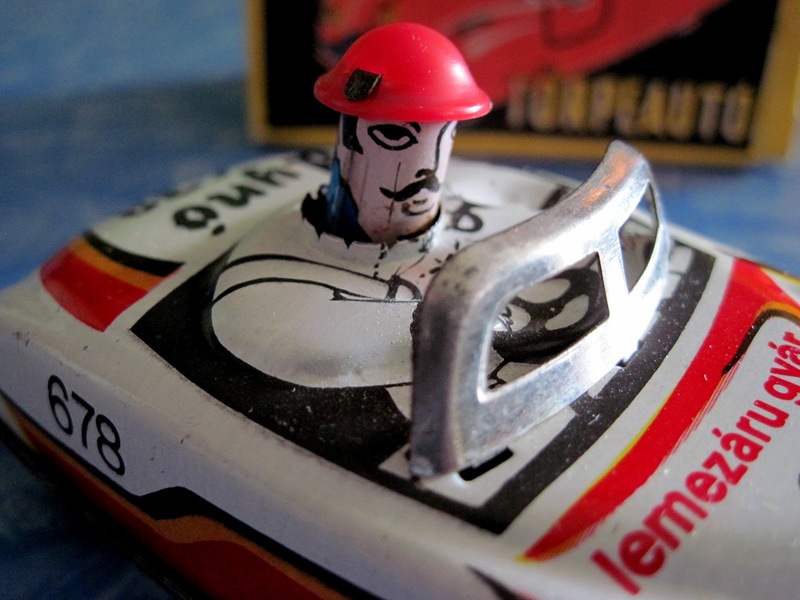 Mobo's cheery red and yellow color scheme was reportedly decided upon by children at a school near the factory. He is a very friendly looking horse! Just in time for Easter, I found this antique mohair rabbit doll. The 10 inch tall rabbit wears his original blue cotton overalls and shirt, along with an old Heinz Pickles advertising pin. He has a gentle smile on his face, and dates circa the 1920s.